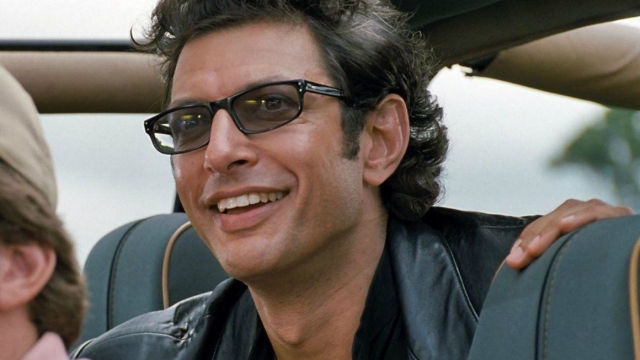 In Jurassic Park, Ian Malcolm famously said “life finds a way.” But Jeff Goldblum’s iconic rock star mathematician chaotician almost didn’t find a way, as it’s just been revealed that the character came perilously close to being axed from the film. The news comes courtesy of Vanity Fair’s Goldblum career retrospective, in which he talks us through iconic roles like The Fly’s Seth Brundle and Thor: Ragnarok‘s The Grandmaster. While the character of Ian Malcolm was quite different in Michael Crichton’s novel (he spends much of the story in a morphine-induced haze and eventually dies of blood loss), he’s still key to the core premise: that a system with as many unknown variables as a tropical genetic dinosaur park is doomed to fail (a theory that’s been proved right many times over). He said ‘You know, there’s a sort of movement afoot with our little committee here as we’re rewriting another version of the script to have that part removed from the script. So since we’ve had this meeting, there’s this little wrinkle that may render this moot. He went on to explain that the screenwriters (presumably, mainly David Koepp) were considering combining Dr. Alan Grant and Ian Malcolm into a single character at one point, creating some multi-headed paleontologist/chaotician hybrid. Goldblum fought back, though. And thank dinosaur Jesus that he was, as he’s rapidly turned into a miniature franchise mascot: being elevated to the protagonist in sequel The Lost World and soon to make a brief appearance in this summer’s Jurassic World: Fallen Kingdom. He’s also lending his dulcet tones to the video game Jurassic World Evolution, which will allow players to construct their own dino parks and then panic as they inevitably escape and eat everybody – sounds fun, right?